Pictorial evidence suggests that the Egyptian pharaohs were the first people to use headboards, which were originally designed to protect against drafts. But through the centuries the purpose and designs of headboards have evolved. Today headboards are used for mainly aesthetic reasons, but one thing has remained the same – a headboard can transform a bedroom. A headboard can add a burst of color, texture or create different lines in the space. These pieces add another visual layer to your bedroom and are the perfect way to add a splash of personality. Whether the headboard is upholstered, crafted with eye-catching details or paired with an accent wall, incorporating a headboard into your bedroom can instantly elevate the design. Here are a few of my favorite headboard styles to make your bedroom pop. Velvet is hot for 2018 and there is a shade for every color palette. 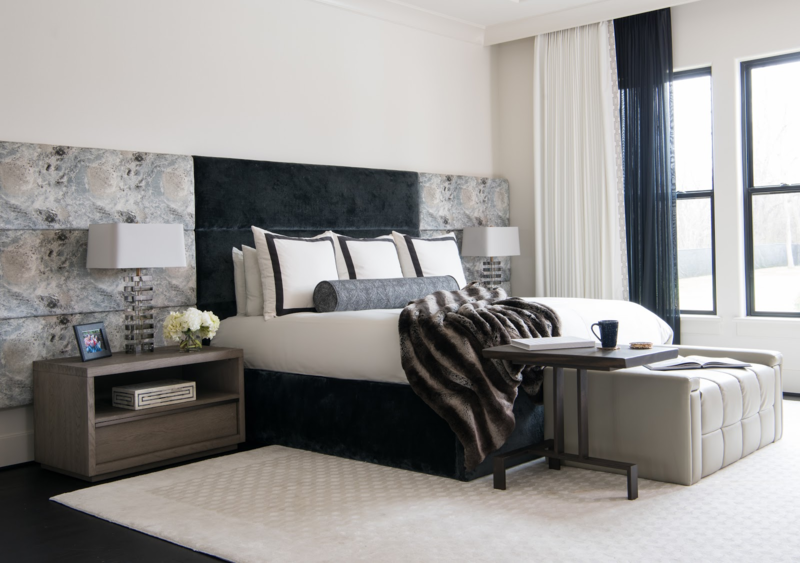 A headboard upholstered in the luxe fabric adds the perfect touch of color in a striking way. We used a gorgeous blue velvet fabric from Fabricut to create this custom House and Town headboard. Paired with the clean white walls and warm wood floors, the headboard is a showstopper! When it comes to neutral colors, don’t be afraid to think outside the box! Blush is a fabulous alternative to more traditional neutral colors. This soft blush velvet headboard gives the space a modern, feminine feel and the color complements the cream sofa and nightstand beautifully. An all-white space provides the perfect backdrop for a whimsical headboard. The rich teal Donghia fabric on this traditional Tudor style headboard gives it a modern feel. It’s perfect for a kid’s room because it’s playful and it won’t be something they outgrow quickly. A common misconception about headboards is they have to stop at each end of the bed frame, but the truth is they don’t! Panoramic headboards add length to the bed and wall while making the room appear larger. When you’re using deep, rich colors like the blue and purple hues in this bedroom, a headboard in a light neutral color helps balance out the space. A panoramic headboard immediately catches your eye, but using a solid, bold color in the center creates a more defined focal point. 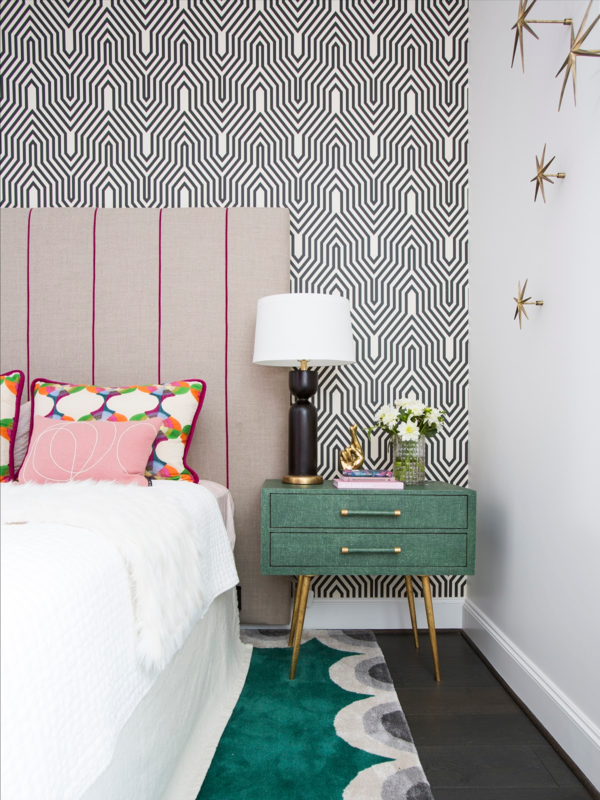 In this bedroom, the dark center panel paired with the two patterned sections keeps the headboard from overwhelming the space. It ties in the drapery and the bedding accents for a very cohesive feel. One of our favorite ways to make a room pop is to center the design around a dramatic headboard. 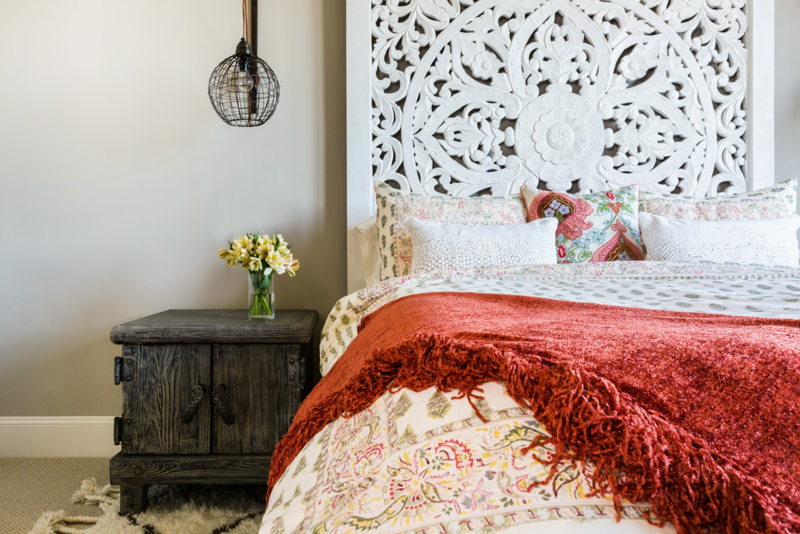 This unique, bohemian style white headboard by Anthropologie Home is hand-carved from solid mango wood and features a very intricate design. When using statement headboards, keep the other pieces in the room simple so that they aren’t competing with each other. 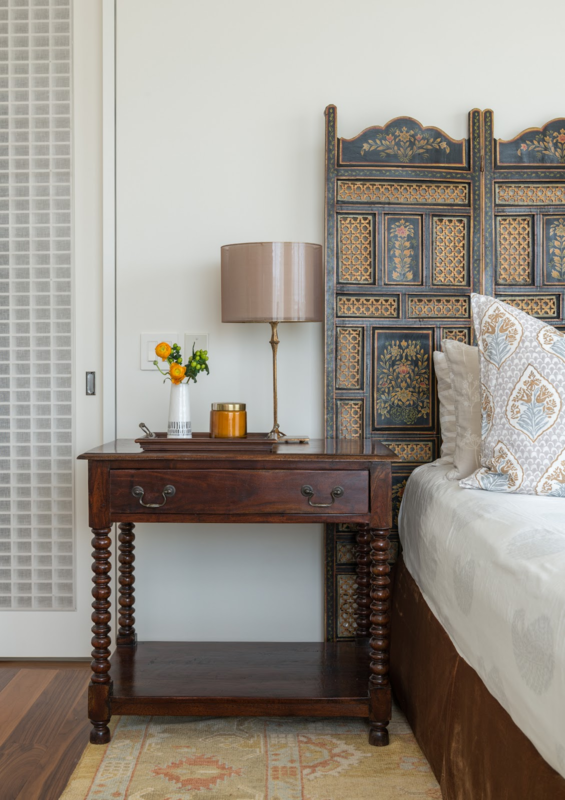 This antique headboard has beautiful painted panels and detailed latticework that gives it a very old-world feel. In this bedroom, we wanted to let the headboard really shine. So we paired the headboard with complementary, neutral colored pieces and added a touch of the beautiful orange color on the nightstand to bring everything together. Pairing an understated headboard with a spectacular wallcovering is a great way to bring the design to life. The black and white geometric wallcovering by ID Collection gives the space a retro vibe and the thin pinstripe of color on this custom headboard with Unika Vaev upholstery matches it perfectly. 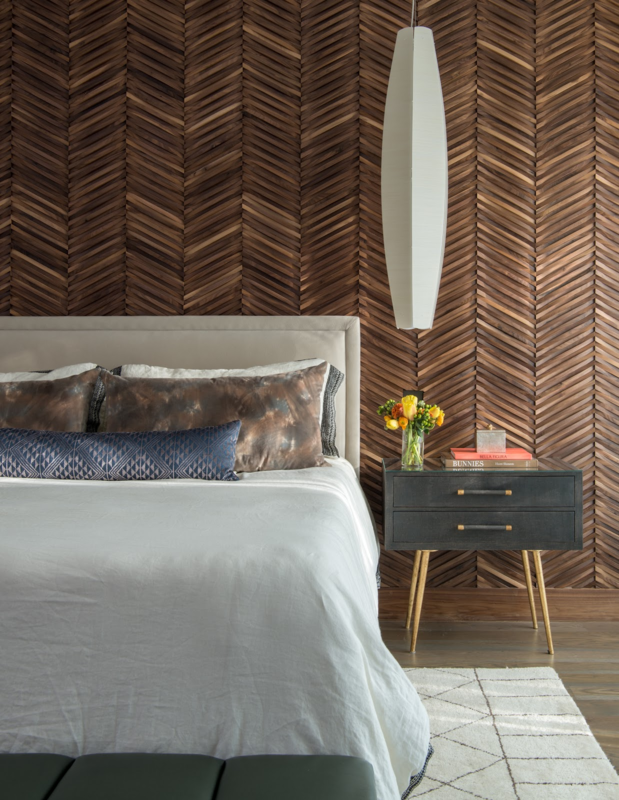 When it came to designing a headboard for this fabulous herringbone patterned wallcovering by Duchate, we wanted to make sure it didn’t cover up too much of the wall. This classic style, custom headboard with Pindler fabric lightens up the space and prevents the room from feeling too heavy with all the wood. Headboards are a great way to add an unexpected design element to your bedroom. You can use them as a statement piece or use them to focus your eye. So whether you decide to upholster a traditional style headboard or install a panoramic headboard, I hope these eye-catching designs have inspired you. You can find more headboard design inspiration on Pinterest and Instagram.